We have changed our Login widget and implemented greater school branding. After logging out, you are now redirected to the login page. When posting on a feed, you developed a more user friendly "Custom" popup to allow you to select targeted groups of people, and to confirm your selection. When you post on a group feed, we give you the option to send Email Notifications (it's unchecked by default). Email notifications are disabled on the school feed. We reset the group feed notifications to "On" for all existing members and it will be set to "On" for all new members by default. This notification can be easily turned off by going to Account > Notifications. We also allow the recipients of the notification to turn it off in a simple click on a link at the bottom of the email. We added a "Select a Date" dropdown on top of your list of events, to allow you to quickly visualize the events for a given date in the future. When you create an event, we added a validation to prevent you from mistakenly creating an event with an end time inferior to the start time. The "Edit" link present on the calendar for each event used to be available for School Administrators only. It is now available for all officers of the group which is hosting the event. We re-implemented the event feedback rating. The average rating for your past events are now displayed on your list of events (for Officer only). Group officers can now add their own Form/Survey link to the "Feedback Request" email sent to event attendees (24 hours after the event took place). 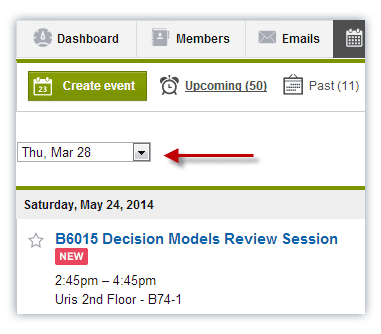 We now allow students to post event feedback in just one click on the email notification link (no need to log on). We added a customizable "Item Type" (i.e. Event Ticket, Merchandising, etc) for all Registration Options when you create your events. We fixed the event "Drafts" view, we are now displaying the latest drafts on top, we don't sort by date anymore. We added a "More" button at the bottom of the "Sent emails" page to allow you to see more than just the past 50 sent emails. We improved the layout and logic of the Add Members and Add Officers popups. We added a Members Extension feature, which allows group officers to extend the default profile of their members: group officers can now create a simple Form and invite their members to provide additional information. This provided information will then be displayed on the profile of the member for other group members to see. We improved the Refund Request notifications to officers and school administrators in charge. You can now decide who will receive the notifications under "Officers > Notifications". Transaction Types are: Event Ticket Sales, Membership Fees, Refund, Expense Reimbursment, etc. 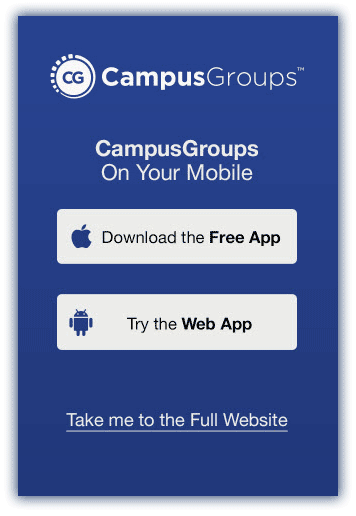 We released our Room Reservation Mobile App (this is only available to schools who have implemented the Room Reservations module). We added a new widget on the School Feed page, for users to see and manage their room reservations. Officers can now cancel a room reservation created by another officer of the same group. We added a button which allows a club officer to set the "Follow Discussion Board" setting to "No" for all members, in just 1 click. We added a "Follow" checkbox for each Section and Category on the discussion board. We also adding Allocations and Revenues on top of each budget for club officers to see. We improved the overall layout as well. We improved the messaging system between a user who submitted a form and the officer in charge of managing the form. We unified the little red notification counters to alert you when something is new. We also implemented color coded buttons on all forms in the system. We improved our Events Upload conflicts resolution page (this is only available to School Administrators for the time being). You can now re-upload the same events and they will be edited as long as you add your own "Event Id" in the Excel file. You will also be able to delete events the same way. The Events Upload script will allow you to edit room reservations as well. On the Groups page, you can now hide the "All" tab and choose which type of group should be listed by default. A new school feed with the ability to post photos. Improvements around the UI and navigation. We are working on merging the Dashboard and Settings tabs into one unified "Dashboard" tab. We are creating an improved and more unified design for all widgets in the system. We are working on a chat feature, between two users or within a group of users. This feature will also be available on our iPhone App. We are working on a new left menu and feed post box. We will soon start posting more relevant automated news on the feed.